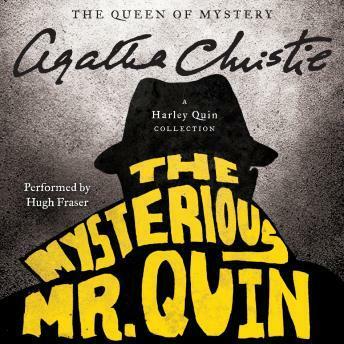 The inimitable Agatha Christie intrigues, surprises, and delights with The Mysterious Mr. Quin—a riveting collection of short stories centered around the enigmatic Harley Quin, whose unpredictable comings and goings are usually a good indication that something is about to happen…and rarely for the best. It had been a typical New Year's Eve party. But as midnight approaches, Mr. Satterthwaite—a keen observer of human nature—senses that the real drama of the evening is yet to unfold. And so it proves when a mysterious stranger knocks on the door. Who is this Mr. Quin? Mr. Satterthwaite's new friend is an enigma. He seems to appear and disappear almost like a trick of the light. In fact, the only consistent thing about him is that his presence is always an omen—sometimes good, but sometimes deadly. . . .